After you finish the tutorial, you will be given a series of new quests. It is only by completing these quests that you can progress through the game. Eventually you will unlock the ability to place new buildings and unlock new characters. The first post-tutorial character you’ll add to your town is Cletus. When you build Cletus’s Farm, you will also unlock Cletus. His farm is unique in that you can select which crop you would like to grow. Some quests require you to harvest a particular crop to advance the story. Be mindful of this, because a crop can spoil if you do not harvest it in time. Usually you have 24h to harvest a crop before it spoils, so don’t worry too much. If a crop does spoil, you’ll lose any money or XP that could have been gained from the harvest. The soil is always fresh, so you can just try again if you didn’t get it right the first time. 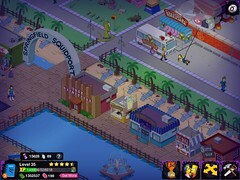 In the next few days, Electronic Arts will be performing maintenance on many of its mobile games, including The Simpsons: Tapped Out. During these maintenance windows you may experience difficulties with logins, connecting to servers, and other issues. These maintenance times may be changed or extended as needed. The episode tie-in for “Penny-Wiseguys” gifted players Springfield’s favorite only mob boss, Fat Tony. This was the first time players were given a new character without having to spend any donuts, as well as the first cross-promotional content update with its own quest line. A full five-months later, in the Level 28 content update, Fat Tony was added to the game for everyone. Perhaps his early arrival in town was necessary. Besides, it probably took some time “acquire” all of the necessary “permits” and “licenses” to run the Legitimate Businessman’s Social Club. After all, if Fat Tony is known for one thing, it’s staying on the up-and-up with the law. While I thought this was common knowledge, Reddit users are freaking out about this “new” development. No these pictures haven’t been Photoshopped, you can actually win some donuts by playing the Sideshow You game. Maybe this is just one of those stories that have fallen through the cracks. Many other blogs and Wikis have reported this information as well, so I’m not quite sure what all of the fuss is about. Donuts in my Sideshow You? It’s more likely than you think.